The newest addition to our Elite series of professional surveillance products is this 2MP (1920 x 1080) resolution eyeball dome IP camera with patented Starlight™ technology. 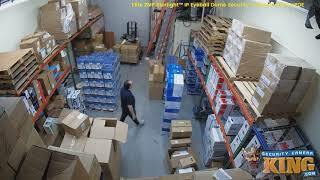 If you’ve been struggling with older analog systems and experiencing grainy images in times when you need a clear picture, like when you need to provide footage to the authorities, now might be the best time to upgrade to IP cameras and an NVR. This camera features a 2.8mm wide angle fixed lens giving you the ability to have a 109° horizontal view, which is great for capturing a large area such as near a garage, front or back door or any large area you are looking to cover. Thanks to its patented Starlight™ technology, this camera has the ability to capture color details even in the most challenging of lighting conditions which is a great change from black and white video at night. Thanks to the built in LEDs, you’ll be able to see up to 164 feet at night when there is not enough ambient lighting to stay in color and it switches to black and white night vision mode. This 2MP camera offers a new technology that is called ePoE which is an enhanced version of PoE (power over ethernet) and when paired with either a ePoE switch or PoC (power over coaxial) devices, you can simplify wiring requirements and go distances that were not achievable previously. This technology provides you with transmission distances up to 800 meters (2624 feet) at a speed of 10Mbps or 300 meters (984 feet) at a speed of 100Mbps. Thanks to its built in microphone you'll also be able to capture audio instead of only video and it also has a built in MicroSD card slot up to 128GB which is great for adding a backup recording option. If anything were to happen to the recorder you would still have any recordings on that MicroSD card from the camera. Using the built-in SD card slot is a great alternative to Cloud recording, as even if the criminal steals your NVR, you can pull the images from the camera as they rarely will take the camera. You’ll love the many features and benefits of this camera such as the Smart H.265+ compression that can reduce bit rate and storage requirements by up to 70% when compared to standard H.265 compression. This camera features protection from outside elements thanks to its IP67 rating which protects against dust and immersion in water and it also has a 6KV rating which indicates a lightning protection rating. We stand by this camera with a one year warranty and when you purchase this camera from us we provide FREE U.S. based technical support for the life of your product along with FREE remote viewing apps for Android and Apple devices.